Back in the first and third parts of the review of my Salsa Fargo, I talked about how the traditional mountain crankset (44-32-22 chainrings) was ideal for singletrack riding, and the touring crankset (48-36-26) was better for road/mixed surface riding. I had still been thinking since then if I could come up with the “Goldilocks” (just right) gear combination that would work well in all conditions. 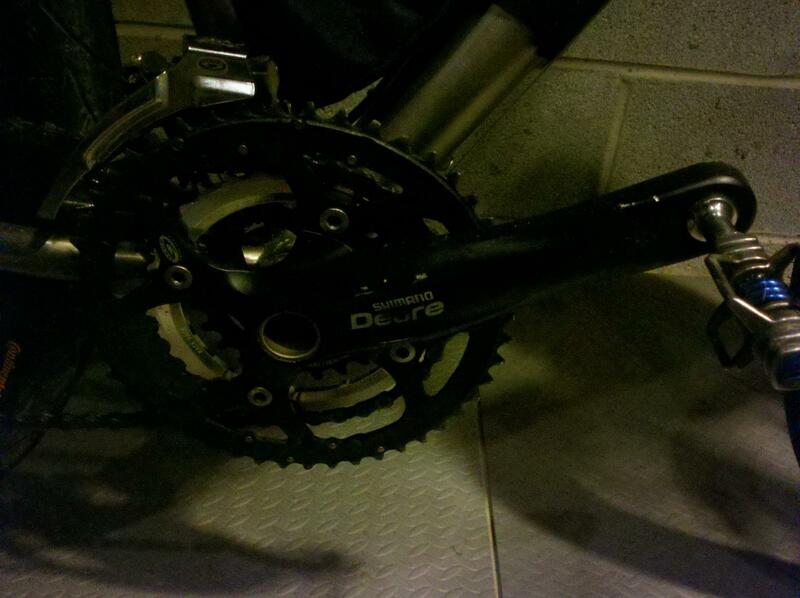 I recently swapped the small and middle chainrings out for Salsa 24-tooth and Race Face 34-tooth chainrings. With my 11-34 cassette, this setup gives me pretty much the same low gears in my granny gear and middle ring as I would have with the traditional mountain chainrings and an 11-32 cassette. I haven’t had the chance to try it out on singletrack yet, but I’ve done a few 50-60 mile road rides, and it has worked out well. The middle ring gives me plenty of range to handle any on-road climbs, and the 48-tooth big ring is still there for maximum cruising on flat roads and descents. Back on March 11, my girlfriend wanted me to meet her after her class for dinner at her mom’s house. I, of course, thought it was a perfect day for a bike ride. The perfect compromise: riding my bike out to her mom’s! 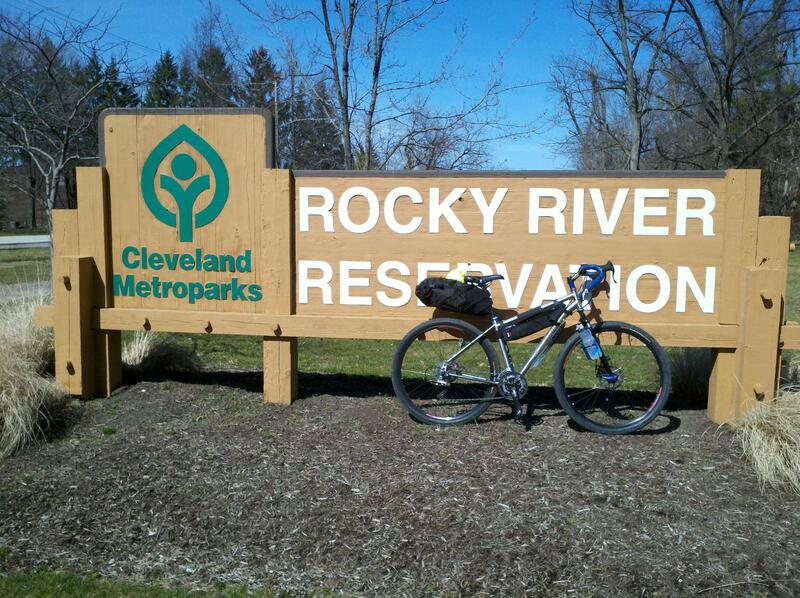 It was a 37-mile ride out to one of Cleveland’s western suburbs, most of which was on the Valley Parkway through the Cleveland Metroparks. 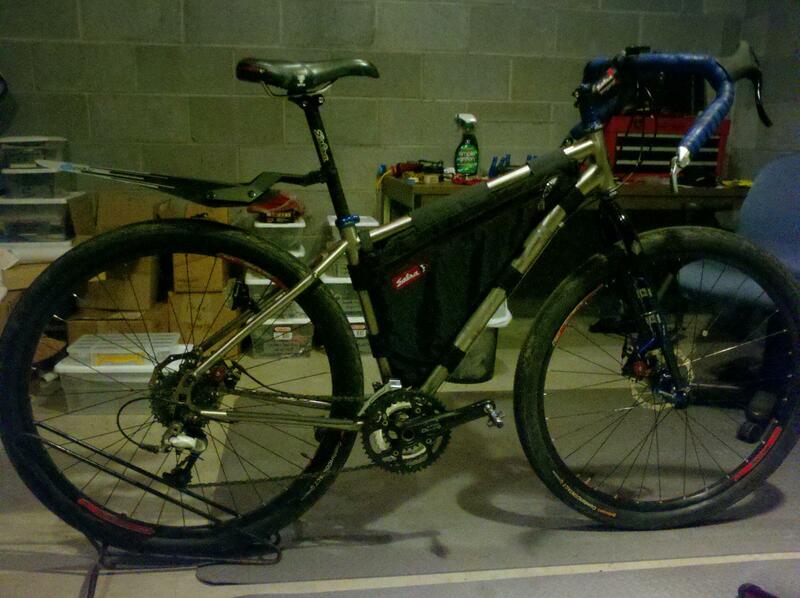 It was a perfect opportunity to test another another new piece of gear, the Revelate Designs Viscacha Seat Bag. The Viscacha is like a regular seat bag on steroids. It attaches to your seatpost and seat rails pretty much like a regular seat bag, except with two very heavy-duty velcro straps for the seatpost. It can hold up to a whopping 14 liters of stuff. For this ride, I first stuffed in a down jacket–not because I anticipated needing to wear it that day (it was over 60 degrees), but because some of the seams had started to come apart inside one of the sleeves and one of the pockets, and I asked my girlfriend’s mom to fix it for me (she enjoys science projects like that). 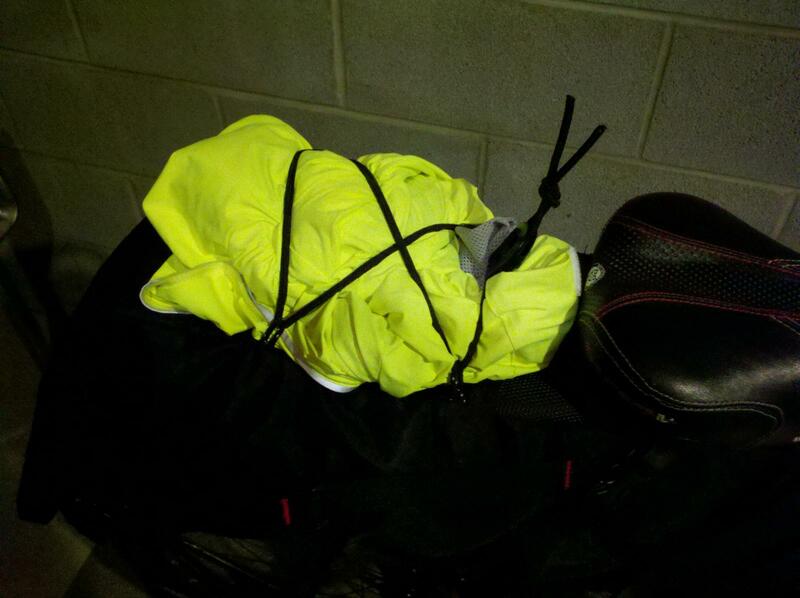 Then, I put in the stuff I’d need once I got there: clean shirt, shorts, socks, pair of shoes, and a small kit with my toothbrush and the like. It all fit with room to spare in the Viscacha. The only suggestion I’d have for improving the Viscacha bag would be to add a small section of shockcord, to provide a place to quickly stow a jacket or such mid-ride. The Viscacha does have four small loops on the top side, designed as a place to attach the optional Spocket bag from Revelate. I put my brain in DIY mode and obtained a two-foot section of shockcord, threaded it through the loops, and voilà–my wish is granted! Finally, while Salsa’s distributor briefly had a couple in stock, I managed to snag one of the frame bags for the Fargo, made for Salsa by Revelate Designs. This, combined with the Viscacha Seat Bag, a couple of dry bags strapped to the Salsa Anything Cages on the fork, and I’m ready to start truly testing out packing schemes for my eventual trip on the Great Divide Mountain Bike Route. I’m also anticipating needing a high-capacity hydration pack; right now I’m leaning toward the Osprey Manta 20. Any thoughts or suggestions?